This newsletter was sent out on Thursday, August 11, 2011.
recommend that you allow your e-mail reader to display images! You have the chance to upgrade your loyalty status at PokerStars for only 10% of the usual loyalty requirement during August. This means that you only have to earn a 10th of what you used to in order to climb to the next step on the loyalty latter and be able to reach even greater rewards! Example: To reach the Silver Star status you used to have to earn 750 VIP Player Points but during August you will reach the Silver Star status by earning only a small fragment of it - 75 VIP Player Points! You will keep your new loyalty status at least to the end of September. By getting a higher loyalty level you will earn more Frequent Player Points for the same amount of play and therefore get a lot more poker action for your earnings! 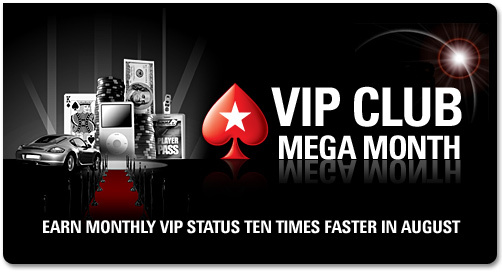 Click here: PokerStars > VIP Club Mega Month > Go! Every Sunday, Gutshot Poker and Party Poker each host a $200 freeroll for BankrollMob members. Everybody can play as long as you created your Gutshot or Party Poker account through BankrollMob. Gutshot Poker: Currently you can get a free $150 no deposit bonus. Party Poker: Currently you can get either a free $150 no deposit bonus or a 5000 MobPoints ($50) gift offer. Note that the no deposit bonuses might not be available to all countries, but you can still signup so you can play in the weekly freerolls. Click here to view the freerolls schedule! EUcasino is a fresh and exciting casino where you will enjoy easy to navigate layout, state-of-the-art graphics, 3D games, smooth game play, the best VIP program in the industry and huge first deposit and reload bonuses. EUcasino offers a free ?10 no deposit bonus exclusively to BankrollMob users ? register thru the link below and use bonuscode BRM10FREE to claim yours. You are also entitled to EUcasino´s unbeatable ?5250 Welcome package which includes 100% up to ?1000 first deposit bonus and other huge bonuses! Claim the first deposit bonus with bonuscode EU1000. Click here to claim your free EUcasino bonus now! Join RummyRoyal for one of the the biggest online rummy tournaments this summer! On the 28th of August at 19:30 GMT you will be able to get your share of a $8,000 guaranteed prize pool. The buy-in is only $11 and you will be able to re-buy 4 times up to level 7. If you ain't got the quids, there's both MTT & Quick tourney qualifications for as little as $1! Get your $5 sign up bonus now! All new players registering to RummyRoyal will get $5 No Deposit Bonus to taste the thrill of playing for real money. All you need to do is download the software through the link below, register and enter bonus code 5WELCOME. You will receive the bonus automatically to your account. Rummy is a game of skill therefore, we are protecting your $5 with blocking access to beginners tables for members with over 3 months experience, just find the tables marked Welcome Table (W) . Just call your friends to join and sharpen your skills in real money tables together! Not all countries may be eligible to receive the $5 free bonus. Click here to get started with your RummyRoyal bonus today! All exactly as you see them in landbased casino. What is even better is, that these slots have one of the highest payouts on the market. Click here to try your 10 free games at Stargames today! High stakes: Portuguese poker prodigy revealed as cheater - for the second time! The Women in Poker Hall of Fame: 2011 inductees announced!